Just Peel & Stick - Easy! Easy Cut - plain scissors, craft knife, guillotine etc. After tracing your product outline, just trim with scissors then simply Peel & Stick! Large enough to cover 2 x standard 6x4 Inch photos. Easy Cut - plain scissors or craft knife. Self-Adhesive - no glues required. Get creative and make your own shapes. 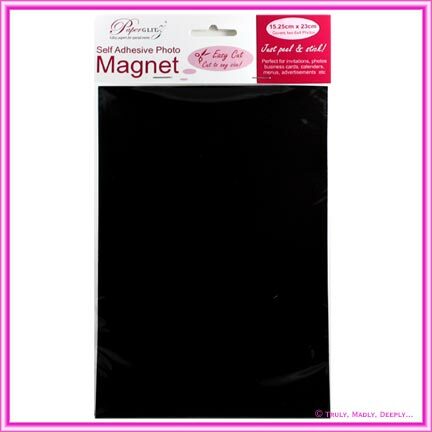 Perfect for DIY magnetic birthday invitations, wedding invitations, save the date cards, advertising, calendars, menus, photographs, postcards etc. Place your printed item face up on the white side of the magnet. Lightly trace the item to leave an outline on the white side. Trim the magnet along trace with a pair of scissors or craft knife. Peel the white layer off and stick it to the back of your item!